Located on the Cape Ann peninsula, the East Gloucester Square Historic District is a well-preserved fishing village on the sheltered waters of Gloucester's Inner Harbor. 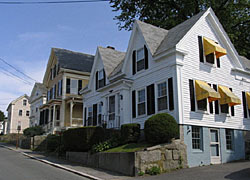 East Gloucester exemplifies the growth of local fisheries during the 19th and early 20th centuries and is architecturally notable for its Greek Revival and Italianate style residential architecture and for its collection of intact maritime-related buildings along the waterfront. The historic district encompasses 75 acres and contains 186 historically significant resources dating primarily from the mid- to late 19th century, including residential and industrial architecture, a commercial center, a smaller commercial area near Rocky Neck, several institutional buildings and marine industrial structures. The centerpiece of the district—East Gloucester Square—at the intersection of East Main, Highland and Plum Streets, is marked by a small cluster of turn-of-the-century commercial buildings. In 1704, city planners laid East Main Street out to access the Square and run along the harbor's edge. The dwellings on East Main Street generally date from the mid-19th century. They are modest, wood-frame buildings positioned close to one another, but set off from the street by shallow frontyards often defined by granite retaining walls. The street also encompasses both of the district's commercial areas and contains an array of well-preserved 19th- to early 20th-century marine industrial complexes, such as Reed & Gamage, the John F. Wonson Company Store and Gorton's, which include buildings, granite wharves and wooden piers. 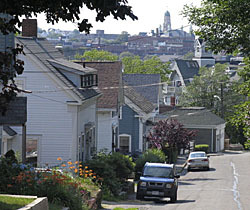 Highland Street forms the residential core of the district, with single-family houses tucked behind granite retaining walls that slope up the hill from the harbor to Mount Pleasant Avenue. The houses largely date to the mid- and late 19th century and reflect the expansive architectural tastes of the period ranging from the Greek Revival simplicity of the Henry Wonson House, to the flamboyant Second Empire George Douglass House, and the Italianate style represented in the Dr. Eveleth House. Of particular interest on Plum Street are the nearly identical Greek Revival cottages, such as the G. Gerring House, the C. Peterson House, the Herbert McQuin House and the J. S. McQuin House. Some of the most stylish, Italianate residences are situated on Mount Pleasant Avenue, such as the David Robinson House. The East Gloucester Square Historic District is located in Gloucester on the Cape Ann peninsula. The district is bound by East Main, Highland and Plum sts. and Mount Pleasant Ave. The Gloucester Visitor Welcoming Center, in Stage Fort Park, is open from late May-late October, Thursday-Sunday, and daily during the summer months, from 9:00am to 6:00pm. Call 1-800-649-6839 or 978-281-8865 for further information on visiting Gloucester.